Harold...♥. . Images in the harry styles club tagged: harry styles. This harry styles icon might contain retrato, tiro en la cabeza, primer, headshot, primer plano, en la cabeza, and closeup. 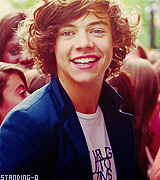 "You’ve got Harry who’s like, the perfect pop star. Just born for it, loves it." "Don’t tu think he looks like baby tarzan?" @Harry_Styles: God only knows what I’d be..